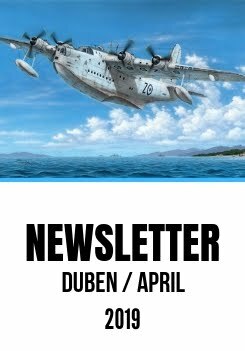 At the beginning of the June instalment of our monthly newsletter I would like to greet cordially all our readers and fellow modellers. Today we are going to focus mainly on our long-time anticipated 1/32 Hi-Tech Tempest release offering also a partial replica of its power plant. We do believe this kit will sell like the proverbial hot cakes as the previous Hi-Tech Tempest also did. Another quite interesting model we are going to offer is a 1/72 kit of possibly the only one mass-produced Czechoslovak military biplane aircraft to ever see service also with floats which was the Letov Š.328v. In the same scale, we have prepared for you also a kit of the Fairey Fulmar Mk.II and night fighting NF Mk.II, the famous British WW2 naval fighter. In the last SH newsletter announced kit of the L-39 in 1/48 had to be postponed to July. And also in that month you may expect the arrival of re-released 1/72 kits SH72044 CA-12 Boomerang and SH72141 Blackburn Roc. The Tempest Hi-Tech kit is back! the basic release of the Tempest kit (SH32049) that appeared on hobby shop shelves when the Hi-Tech had already been sold out is becoming unavailable too. It was our original intention not to get back to the idea of Hi Tech Tempest kit any more as it was meant to be a unique and limited release model. But modellers still kept asking for its re-release, so we decided to prepare for them a new Hi Tech edition of the Tempest. But what could turn this one also into a once in a life time feature? Then the idea came to offer the modeller a partial resin replica of the Tempest power unit, the Napier Sabre engine which had been 3D designed and its master parts produced in a 3D printer to achieve the highest possible quality and accuracy. Besides the resin engine, the kit also comprises detailed resin parts for the cockpit and resin wheels, a set of photo-etched parts (seat belt buckles and other detailed parts both for the interior and exterior of the kit), HGW laser pre-cut seat belts, spray masks for canopy, clear parts and wheels. Another addition not available with earlier Tempest Mk.V releases is an extra sprue offering under-wing rocket projectiles. So, all in all, the kit comes on nine grey styrene sprues and one clear sprue. The surface of all major parts is covered with very finely rendered rivet lines. A very nice feature of the kit is a detailed A4-size full-colour instruction booklet that will guide the modeller all through his build. The underwing weapons are meant for one of the kit´s five camouflage schemes. The modeller will be able to choose between the following ones: Le Grand Charles, the machine of the highest-scoring French ace pilot Pierre Clostermann, Tempest EJ750/JBW, a personal mount of WgCdr J.B.Wray, Tempest EJ762/JJ-F of F/L D.C.Fairbanks DFC and Two Bars (12.5 kills), Tempest SN206/5R-B of Belgian pilot F/O G.A.Rens and silver-coloured post-war Tempest SN330/J5-H of S/L R.B.Cole, DFC and Bar which is the machine to be fitted with the underwing rocket projectiles. The decal sheet features also a full set of stencils, including those for the cockpit and the fuel tanks. The Tempest is arguably one of the best fighter planes of the Second World War. During the conflict, the opposing sides were constantly competing against each other to keep abreast of the latest technological developments, and as a result it led to ever more powerful and effective warplanes. In 1941, the new German Fw 190 fighter began to enter service and in response the British hastily developed the new Spitfire versions along with introduction into service of a new type called the Hawker Typhoon Mk.I. The introduction of the Typhoon and its powerplant into service was not without certain trouble and as restrictions of the Typhoon design soon emerged, Sydney Camm, Hawker´s chief designer, began to design a new fighter aircraft, partially based on the Typhoon. As the number of alterations to the original design was quite substantial, the new plane was to carry a new name, the Hawker Tempest and soon proved to be one of the best WW2 fighter planes. And our Hawker Tempest kit brings you the very best quality we have achieved so far in the field of 1/32 scale aircraft model kits. On 24 May 1939 after long years of subordination, the British Fleet Air Arm became independent from the RAF. But while still under the RAF, specifications O.8/38 had been issued calling for a naval fighter and reconnaissance aircraft with long range and heavy (by the 1938 standards) armament of eight .303 machine guns. The plane was to carry a crew of two, although the second crew member was not to have a rear-firing weapon, his task was only to navigate over the sea as the pilot, by the Admiralty´s opinion, was not able to do so. The first production machine serialled N1854 was taken aloft for the first time in December 1939. Fulmars of the Mk.I version were fitted with R&R Merlin Mk.VII engines and the production gave a total of 250 airframes, while there were 350 of the Fulmar Mk.II built which featured improved performance and some of them were finished in night fighter version known as the NF Mk.II. These were equipped with uprated R&R Merlin Mk.30 engines, had modified radiator system and other smaller improvements. Heavier armament of four .5 machine guns was also possible. For a fighter machine, the Fulmar possessed rather low performance, most of all they were rather slow. But in 1940 when they saw military service for the first time, they meant quite a significant leap forward against Skua and Sea Gladiator airplanes and achieved many victories mainly in heavy battles in the Mediterranean. The Fulmar saw action also over the Atlantic, Indian Ocean, Ceylon and elsewhere too. In 1942 the Fulmar became to be gradually replaced by Sea Hurriacane, Seafire and Martler single seat fighters. The night fighter NF Mk.II version kept on serving until 1943 and in 1944 were put out ouf first-line service. In spite of its obsolescence, the Fulmar holds a primacy in being a top scoring British naval fighter aircraft of the Second World War. Until now, we have offered only the Mk.I version in 1/72 scale although in 1/48 we have covered all Fulmar versions. But we want to change it now and bring you also a small scale Mk.II and NF Mk.II kits. Our model comes on three grey styrene sprues accompanied by one clear sprue, with a set of detailed resin parts and also photo-etches. The decal sheet and full-colour instructon sheet caters for three Mk.II Fulmars: a yellow-tailed machine which took part in Operation Pedestal, an Operation Torch machine with US national markings and a machine from the Indian Ocean. The last of our options is a NF Mk.II plane dubbed „Ringa“. such as the F6F-3E/-5E Hellcat or maritime attack aircraft as the SB2C-4E/-5E or TBF-3E / TBF-3S. The set is 3D designed and master part produced using 3D printer. This set brings a new nose wheel and a pair of mainwheels with finely detailed tread pattern, hub caps and brakes. The original kit parts lack many of the detail as well as the brakes (the same for the resin wheels produced by the competition). 3D designed and master parts produced in 3D printer. The set offers completely new main undercarriage wheels to accompany any version of the F2A Buffalo fighter kit. 3D designed, 3D printer produced master parts. The set includes new landing gear wheels with detailed tread and a new tailwheel. The Revell kit offers less detail and has wrong wheels. The set also contains a tail wheel.